Williams co-founder Patrick Head has spoken out for the first time this year about his future, making it clear he is not retiring. The team's chairman Adam Parr said in May that Head would be stepping down "at some point this year". But Head, 65, told BBC Sport: "All I know is I'm not retiring. "I probably won't be involved with Williams Formula 1 in the same way from the end of the year but I'll still be involved in some Williams activities." Head, who founded the team with owner Sir Frank Williams in 1976, is currently the team's director of engineering. It is not yet clear whether he will retain that title but he will remain a shareholder and board member. He said he would "certainly turn up at a few races" in the future, but would not be taking a hands-on role in the engineering management of the F1 team. His key involvement is expected to be with some of the team's other activities, such as Williams Hybrid Power, which develops energy recovery systems for both the F1 team and wider industrial applications, as well as in an advisory capacity wherever necessary. Head said he had been heavily involved in the restructuring of the team following the worst start to a season in their history. Technical director Sam Michael and chief of aerodynamics Jon Tomlinson have resigned and will leave the team at the end of the season, and Williams have recruited former Ferrari and McLaren designer Mike Coughlan as their chief of engineering. Michael is still running the 2011 programme while Coughlan concentrates on the 2012 car. Head said managing that process was "interesting". Williams are the third most successful team in F1 history after Ferrari and McLaren, but they have not won a race since 2004 and are ninth in the constructors' championship after nine races, with only the three teams who were new to F1 in 2010 below them. Head admitted that the team had had "a pretty awful start to the year" but insisted they were now back on track. Williams have managed to get a car into the top-10 shoot-out in qualifying in three of the last five races and are running on the fringes of the top 10 in races. Head said: "Generally, in a 24-car field, that's not good, and it's not where Williams want to be, but it's not, like, go away and hide and you couldn't run a chip shop." He admitted that the team had been through a crisis in which "a number of people in quite strong positions were going round and wringing their hands and saying it's a disaster - not good". And he said the team had had no option but to restructure the technical department after years of under-achievement. "If you look at the last four or five years, there's a regular pattern where we tend to look a bit stronger towards the end of the year, over the winter we fall back again even though everybody's working very hard and then start again with the same type of cycle, and sometimes the start of the year is lower. The most important thing is I just want to be racing next year, and hopefully I'll be here with Williams. "If it goes on over four or five years, you've got to change it, that's all there is to it." 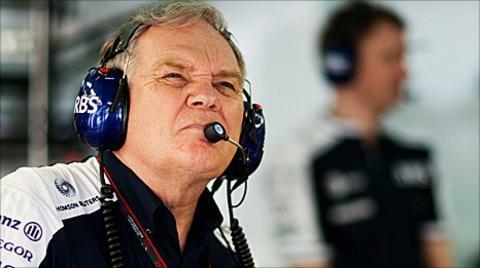 But he added: "We've got some pretty good technology at Williams but we haven't had the balance of the car we wanted. I think it will get a lot stronger from now on. "I'd say the disciplines and procedures and determination to succeed, that's all solid and strong. "When we get on top of why the car has been so unstable in slow-speed corners relative to high-speed, which we're making progress on, I think we'll be revisiting the top 10 quite often in the last part of the year." The team will retain Venezuelan novice Pastor Maldonado next season - he has impressed on occasion and his presence is linked to a lucrative multi-year sponsorship deal with his country's state oil company. Veteran Brazilian Rubens Barrichello's contract comes to an end this year. There have been rumours linking Williams to German Timo Glock, who drives for Virgin, but Parr said this week that sticking with Barrichello and Maldonado was "vastly the most likely outcome". Barrichello, who has competed in more grands prix than any man in history, says he wants to stay. "Next year I'll be 40, and I'll have been racing for 20 seasons in Formula 1," he said. "They are good numbers, and I want those numbers. "The most important thing is I just want to be racing next year, and hopefully I'll be here with Williams. "I am in conversation with the team. They need to show me their interest as much as I'm showing mine, and then we can do business."